This book demonstrates simple steps you can make to live a more “green” lifestyle, displaying the simple steps an individual can take to live a more-sustainable life. Features include a listing of which are the top 10 organic products to buy, information on green home care and garden alternatives, and what a carbon footprint is and how you can lessen the effects of leaving one behind. Most importantly, Horn provides affordable ways to adopt sustainable practices that can be easily integrated into our lives. Order it on Amazon today! We found this great idea on rachaelraymag.com! Instead of throwing those cool canned food cans in the recycling bin, wash them out and use them as vases for the table. Make sure to pick cans with neat labels, sizes, and color, and you will have a retro-looking centerpiece! Great Use for Those Mateless Socks! I was flying home this last weekend and picked up one of my favorite magazines, Everyday with Rachael Ray, in the airport. As I was flipping through the pages, I noticed this great, eco-friendly idea that everyone could likely relate to… what to do with all those “one-socks” that never find their mates! Orla Kiely’s idea? Take those loose socks and create cute flower or herb pots that sit on the table or windowsill. Simply snip off the sock bottoms so that the socks can lay flat and cover recycled glasses, jars, and pots. Here is a product we found that was buzzed about on Ideal Bite: Little Bug Baby. 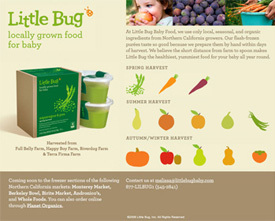 Little Bug Baby produces baby food using ingredients from local farmers. Soon to come to stores in the frozen section, including Monterey Market, Berkeley Bowl, Bi-Rite Market, Andronico's, and Whole Foods. For more information, check out their website www.littlebugbaby.com. Here’s a cool craft (and gift) idea you and/or your kids can make throughout the year! 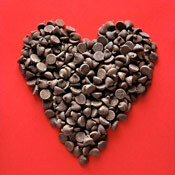 Looking for the perfect green gift for your Valentine? Look no further—treehugger.com has put together a great list for everyone to check out! If you’re committed to living an organic lifestyle, you eat organic foods and have probably replaced toxic household cleaners with products that are safer for your health. Time now to move on and create a healthier environment in the one room where you spend one-third of your life: your bedroom. Look no further than the pillow you place under your head each night. If it’s made with synthetic materials you could be sleeping with toluene, diisocyanate, formaldehyde, PBDEs and petroleum derivatives. Toss that pillow into the recycling bin and get a better night’s sleep on something that is all natural or organic from the inside out. Before the 1950s and the advent of poly-fiberfill people slept on pillows made from materials found in nature, heavenly sleep conducive fibers and fills like goose down, cotton, natural latex, wool. Rest your head on any of these natural fibers and you’ll notice an immediate difference in your quality of sleep each night. Some fibers like wool enhance deep REM sleep by wicking moisture away from your head, keeping you cooler so you toss and turn less often. A latex contour pillow or buckwheat hull pillow will support your neck and shoulders. Matching your sleep preference to the right fiber and pillow configuration is like finding the right toothbrush, it’s very personal. Which organic pillow is right for you? Do you prefer a soft or firm pillow? Are you vegan looking to stay away from animal products? Do you have allergies? Looking for a washable kid-proof pillow? With so many choices there’s a pillow for everyone. Cotton Pillows – As old-fashioned as a pillow can get. These are the pillows your grandparents slept with every night. Cotton is pure and natural and if it is made with organic cotton, can be a great pillow material for anyone with chemical sensitivities. Cotton does not "grow mold" with age like down and feathers, and has the ability to "breathe" during warm weather unlike synthetic pillows. You’ll enjoy a cooler and more comfortable night's sleep on a cotton pillow. Cotton pillows start out puffy and over time tamp down to become pretty firm. Avoid “green cotton” pillows because they have a strong odor. Wool Pillows – Odd as it may sound to rest your head on wool, this material – as a pillow fill - actually aids in sleeping comfort. Wool has a natural moisture wicking ability so your head stays cool while you rest; you toss and turn less often staying in deep REM sleep longer. This natural ability to reduce the moisture level in your pillow inhibits mold and mildew from forming. Best of all, dust mites cannot thrive in wool making it a great alternative for people with allergies. Wool pillows are light and puffy, making them a great alternative to down. You can choose either sheep’s wool or alpaca wool, which is lighter and warmer. Natural Latex Pillows – Natural rubber or natural latex as it is more commonly called, is an ideal choice for pillows because it is flexible, provides good support, and lasts a good long time. Natural latex absorbs moisture and regulates heat, circulates air and inhibits the growth of mold or mildew. Latex foam is made from milk harvested by tapping the Hevea brasiliensis or the common rubber tree. Hevea milk contains an antibacterial substance that is a natural dust-mite repellent. Choose latex pillows that have either a solid latex core for firm support, a contour shape to mold to your neck and shoulders, or shredded latex to simulate the puffiness of down. Hypodown® Pillows – Patented by the Ogallala Comfort Company, Hypodown is an alternative to pure down. According to the Ogallala web site, their pillow fill is hypoallergenic and they say all their tests show that people who are allergic to down can sleep with Hypodown and not have allergic reactions. Hypodown is a mix of 80% goose down and 20% Syriaca clusters. Syriaca clusters come from the Asclepias plant, commonly known as milkweed. Dust mites don’t like the milkweed. Ogallala says they harvest their down from farm-raised geese during the natural molting season. Silk Pillows – A fiber with an impressive 3,000 years history. Luxurious and soft, silk pillows are lighter than air. Silk floss unlike cotton and wool, is made up of extremely long fibers, making silk one of the strongest of natural fibers. Silk fill doesn’t bunch up and has a natural ability to breathe. Silk conforms to your head and shoulders, regulates body temperature, and provides surprising comfort year-round. Buckwheat or Millet Hull Pillows – Grain filled pillows have been used in Asian countries for centuries. They help eliminate stiff neck, shoulder pain, back pain, restlessness, headaches, and sometimes even snoring. That’s because buckwheat or millet hull pillows mold to the contours of your head, neck and shoulders exactly. Sleeping with a buckwheat/millet hull pillow elevates your head for proper alignment, and cradles your neck / head with steady, gentle support. One big disadvantage: a buckwheat hull pillow is noisy. Look for pillows made with a layer of wool to muffle the sound. Millet hulls are not as noisy. Kapok Pillows - For those who want the feeling of down without the allergy discomforts, this is a good pillow. Harvested in the rainforest, kapok is a fiber extracted from the seedpod of the kapok tree, which provides the touch and comfort of down. Kapok pillows are lighter than cotton, soft, and yet supportive. Where can you buy organic pillows? Finding all-natural or organic pillows is not as difficult as you might think if you shop online and many health food stores carry vegan pillows. Christine Chamberlin is co-owner of The Clean Bedroom and a freelance writer specializing in the subject of creating healthier sleeping environments. See also: http://blog.thecleanbedroom.com/.